Auchenskeigh, also previously known as Dullars, may have been a small lookout fortification constructed several hundred years back. The original building was on the northern boundary of the Cuningham lands, bordering the Campbells of Loudoun territory to the north, and the Wallaces (William & co) of Kilmarnock, to the west. It would have been built strategically on the top of a small hill thus giving a 270 degree view over all land to the west, north and east. Before this the prevailing westerly winds would excite the wild horses that grazed on that green mound. In the late 1760s the owner was a Captain William Cuningham, until he was prompted to build in it's place a fine Georgian Mansion. He was prompted to do this by a young woman - or was it her father? In about 1769 'Captain William Cuningham of Achenskeith' set sail for the island of St Kitts in the West Indies to collect sugar from a plantation owned by a fellow Scot called Colonel William McDowall. His plantation manager, Robert Colquhoun, (also from the West of Scotland) had a beautiful teenage daughter called Agnes. Capt. William and Agnes fell in love and he asked her father for her hand in marriage. Robert Colquhoun agreed, and William said, "I will take my new young wife back to my old, cold, damp Castle in the west of Scotland where we will live happily ever after!" His prospective father-in-law replied "I don't think so! As a dowry, I will finance the building of a new home for you both, a beautiful little Georgian Mansion. And as a reminder of how it came to be, you must call it after the money I have made here on St Kitts, my 'Pieces of Eight' - the Spanish Dollar, or as it was once known, the Dalar. You must name the new house Dallars! Also, the facade must be of the finest pink sandstone - a reminder of my daughter's pretty, rosey cheeks." William whole heartily agreed. He and Agnes married in 1770, he was twenty six years old and she, by then, twenty one. Their second child, a son also called William, was born in late 1772. Dallars House was completed in 1779 and as a final reminder of its conception William and Agnes planted a Spanish (or Sweet) Chestnut tree close by, to the north west of the property. It is still there to this day, just beyond the wishing well. A friend of theirs at the time, and occasional visitor, happened to be a certain Robert Burns - a poet I believe! In the mid 1800s the Second Marquess of Bute died leaving a young widow, Lady Sophia Hastings, Countess of Loudoun, and a six month old son, the Third Marquess, John Patrick Crichton Stuart. The 2nd Marquess' brother, Lord James, was unhappy that he had not inherited a fortune, and out of spite, denied Lady Sophia and her son use of either Dumfries House at Cumnock, or Mount Stuart on the Isle of Bute. 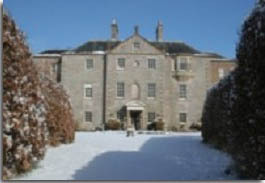 Lady Sophia adapted to her predicament and rented Dallars House, not far from both Loudoun and Dumfries House. They stayed in this small country house between 1849 and 1853, when they moved to Mount Stuart. For the full story read 'The Grand Designer' by Rosemary Hannah. On the third of August 1962 Rab and Sylvia Richards became the proud owners of Dallars, unaware of its history - and condition!. In 1964 Aird Walker & Ralston, electricians from Kilmarnock, recommended that the house be rewired. In 1995 their sons, now the joint custodians of this listed building, finally had the job done! In the mid 1970s, to provide employment and an income to maintain the house, Dallars Riding School (now a livery yard) was set up and so again horses grazed in the field on the 'windy hill', where the castle had once stood! Some renovation work, including a new roof and the division of the house into three apartments was carried out in the late 1990s, with the assistance of Historic Scotland and the Clydesdale Bank. In August 2012 the ground floor renovation, the last part to be done, was finally completed by the Richards - only fifty years after it was probably required!